Many of you who see this page will either know me or know of me from e-mail lists and newsgroups. I am not new to them, but I am new to the Web. My previous computer was so old it couldn't access web pages. However, it bit the dust a few months ago, and my web family decided that I needed a new computer and combined their efforts to get me one. Thanks to them, I am now here. Some of the info here and on other pages will probably close to letter perfect - corrected or typed in by my soul sister, cyberMom. Yet other things will look strange, with misspellings, and typos. Those are my original "fibro" posts copied, pasted and formated for these pages by cyberMom. For those who do not know me, I am confined to my very modest home most of the time due to the fact that I have Fibromyalgia and various other maladies that affect my ability to be out and around and do many of the things I used to do. I have much information on these diseases and they will be going up on my soon to be Fibro page - as soon as cyberMom can get them from me and get it done. However, there is a small start there already and you can find it so click on the link above and it will take you right there. I am an animal lover - especially rottweilers. I will also have a page - hopefully very soon - on rottweilers - links, information, and rescue efforts. It will also include links and information on other breeds of dogs and other animals - especially about rescues needed. 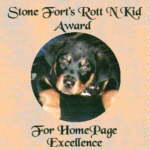 I am especially proud of the award I won - and by clicking on the award above, it will take you to the Stone Fort Rottweiler page. I love to cook and collect recipes, and have many, many other interests. As I can fill cyberMom in on all of these, she will add them to these pages for me. I have the beginnings of my recipe page or my bread page. I also hope to have a medical page (especially on fibromyalgia), a crafts page, a rotweiller rescue page, an inspirational page, and whatever I can think of to have. I guess that sounds like I'm really happy to be joining the net "for real". I've had good times and bad in my life - as we all have - yet I will not stop fighting for better things for me and mine. I'm living in Texas at the moment, and that may or may not change in the future. But, whatever life hands me, I'll deal with it. If you have any questions about fibromyalgia or any of the other problems I have, please write me. The one thing that e-mail and newsgroup access only has done is give me the ability to find information sources. If you have any sources to share, please send them, too. I'd love to add them to my pages. There is help out there, and some knowledgable doctors, but they're not easy to find. If we help each other locate "good" treatments and information, we all benefit. As those with fibro will understand, I don't always write like this - in fact, the days I can write like this are few and far between. My cyberMom is putting these pages together for me, and will keep them updated. You can help both of us stay up to date on information here, if you will let us know of any expired links and of new information as it becomes available. Just click on my mailbox below to contact me or send links and expired info to CyberMom. Mama Yasmini (also known as mamajaz and Crone) designed these pages for me and got them up on the net. Visit Mama Yasmini's Place. to see what she has available - the exotic tropical plant seeds from around the world, other products as they become available, and magickal supplies from Lady Raven. Occasionally, as in the case of Lady Raven's products, she adds pages from people who, for one reason or another, do not have web access. These products are then available directly from Mama Yasmini.